Here at Guardian, we have built a reputation for being the authority on new home construction in the Cheyenne, Wyoming area. We continue to offer and build for both customers in the high-end custom home market, in addition to the entry-level single family home space. As Wyoming’s population has expanded, so have our options for clients. Even ten years ago, Cheyenne was still joked about as the “wild west,” but it has beautifully broadened into a highly sought-after property market. 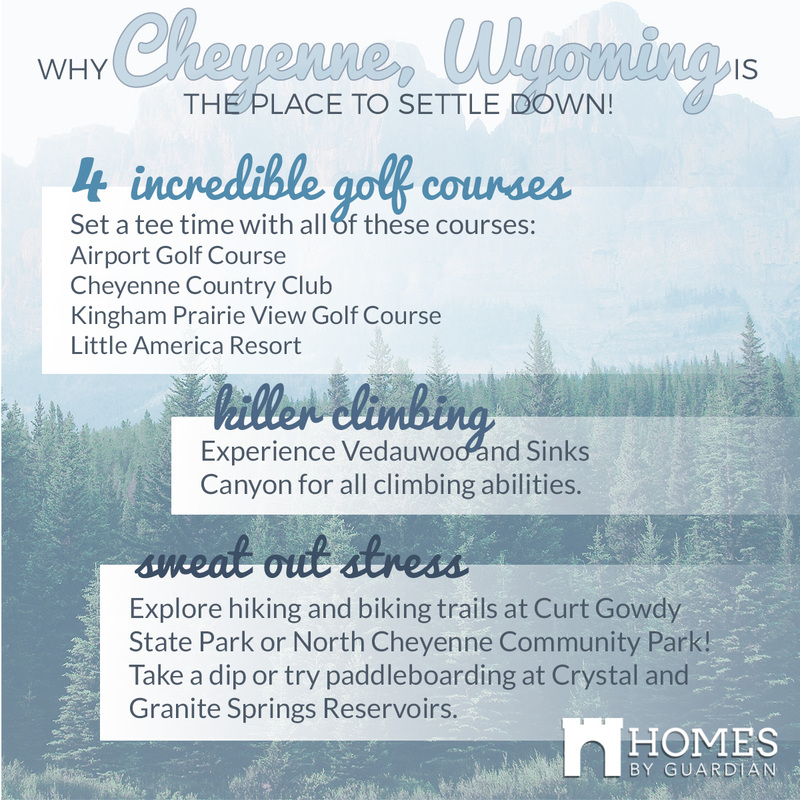 Take advantage of what Cheyenne has to offer before the secret is out, and plant your roots here! There are so many things to take advantage of in Cheyenne, and below are the top outdoor activities! Wyoming is known for its sprawling hills and beautiful mountains; it’s truly a state of wide open spaces! If you’re looking for an outdoor community, Cheyenne is your place. Airport Golf Course – The City of Cheyenne claims this as the golf course, as it hosts the only professional golf tournament in the state! Kingham Prairie View Golf Course – This quick, but beautiful, nine-hole course often has antelope for guests! Little America Resort – People enjoy this course for its cobblestone cart path in the executive-length course. Cheyenne Country Club – This semi-private course happens to be open to the public on Mondays and Tuesday, and offers bluegrass fairways and Bermuda grass greens! Another little known secret is that Wyoming has great climbing, so avoid the crowds of hipsters in Colorado, and climb Wyoming. If you’re in need of some climbing experts to learn from, contact Granite Grip Climbing for dedicated climbing teachers who provide fun and safe instruction. This intriguing climbing area is just 27 miles west of Cheyenne, nestled in Medicine Bow National Forest. This area is complete with giant boulders and rock formations formed from ice, wind, and water. Vedauwoo (Vee-DA-VOO) is perfect destination for bouldering and rope climbing, and the crack is whack! If you’re into a road trip, check out Sinks Canyon, about four hours Northeast of Cheyenne. This destination is home to the International Climbers Fest in July, and has over 300 climbs with varying ability. This state park is 24 miles west of Cheyenne and touts awesome hiking, equestrian, and mountain biking trails. Enjoy three covered group areas while camping, fishing, or boating. Within this area, you’ll find Crystal and Granite Springs Reservoirs, perfect for rainbow trout and kokanee salmon fishing and watersports of all kinds. Home to the reservoir is Mountain SUP (stand up paddle board) ready to take you out on the water for paddleboarding and kayaking. If you’d rather stay closer to home, enjoy this park complete with eight soccer fields, an archery range, and hiking and biking trails. With all the amazing outdoor activities, Cheyenne and Homes By Guardian are ready to greet you! Check out our homes today and check back next month for part two!